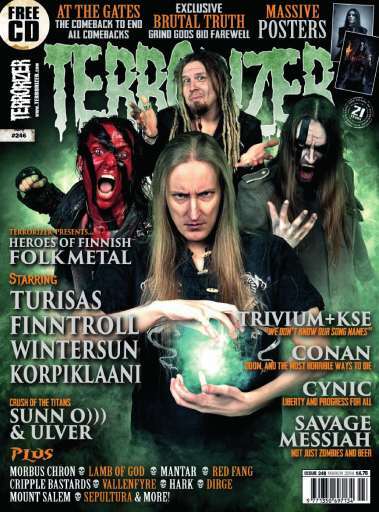 Draw your swords, ready your woad and grab your accordion, as Terrorizer’s brand new issue tells the story of Finnish folk metal, one of metal’s most passionately followed scenes. We bring you the full tale from the Land Of A Thousand Lakes, with the help of some of some of the major names, FINNTROLL’S Vreth, Jonne Järvelä of KORPIKLAANI, Warlord Nygård of TURISAS, and WINTERSUN mastermind Jari Mäenpää. With SUNN O))) & ULVER collaborating, we tracked down Kris Rygg and Stephen O’Malley to find out how this unique fusing of creative minds came to be – and what the blazes it all means. We spoke to BRUTAL TRUTH legend Dan Lilker on why he is retiring as a full-time touring musician, and why it is the end for the grind gods. 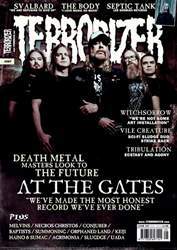 We also got the full story of the new AT THE GATES album, the most anticipated comeback record since Carcass. 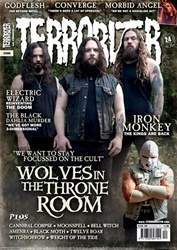 THE WOUNDED KINGS tell us why doom makes them happy, SAVAGE MESSIAH explain why they’re not just about zombies and beer but why you can’t write thrash songs about Austrian Business Cycle Theory, CYNIC talk creative freedom and why Paul Masvidal finds it hard to escape the noise, and TRIVIUM and KILLSWITCH ENGAGE put their metal credentials on the line. We corner SEPULTURA with a bottle of whiskey, hunt down VALLENFYRE in a sub-zero studio, get schooled in brutal methods of execution by CONAN, find out why MORBUS CHRON have found their own death metal voice, hear tough tales from NOTHING, find out what it takes to keep grindcore fresh with CRIPPLE BASTARDS, get the full story on how DESERTFEST came to be, and discover RED FANG have rather angrier taste in music than you might expect.